Fence and Gate Supplies is the company to trust when in need for a high quality gate. It can be easily automated and are also practical whilst securing your property. Swinging Gates are also great investment to any home or business as they add value and security to any property. Furthermore, for automatic Gates, we use Centsys Swinging Gate operators as they are highly engineered motors that are reliable over long periods of time. They do not need any side room to slide back as do sliding gates. You do not have to go to the expense of digging up the driveway to lay a concrete footing. A reasonable pair of hinges is all that is required to enable the gates to be opened and closed. Gate operators can be conveniently fitted to existing Swinging Gates in most cases, also if there is no mains power at the gate there is normally a good selection of low voltage gate operators which can be used. 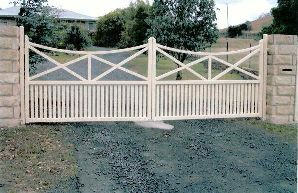 When it comes to ordering a Gate, we are renowned for innovative and also stylish designs. Therefore, we pay very close attention to designing, manufacturing, and also testing. Furthermore, we also take on custom-design options, and manufacture your manual or electric gate in aluminium or galvanised steel. With all of our outstanding products, our Swinging Gates are expertly made to your specific requirements. Further still, our products are professionally installed for a perfect fit every time.